Endive is a great spring vegetable. I love the bitterness of the endive, which is not too powerful. I simmer the endive in broth and balsamic vinegar until it gets soft and the liquid makes a thick syrup that I drizzle on top. The sweet balsamic glaze pairs very well with the slightly bitter endive. Place oil in a heavy sautee pan and warm of medium high heat. Place endive cut side down and brown for 1- minutes, until it gets brown on one side. Flip endives over and brown for 2 minute. Flip endive back to cut side down and add broth, salt and pepper and balsamic vinegar and lightly cover the pan and cook for 5 minutes. Remove lid and cook until the liquid has become thick and almost syrupy. 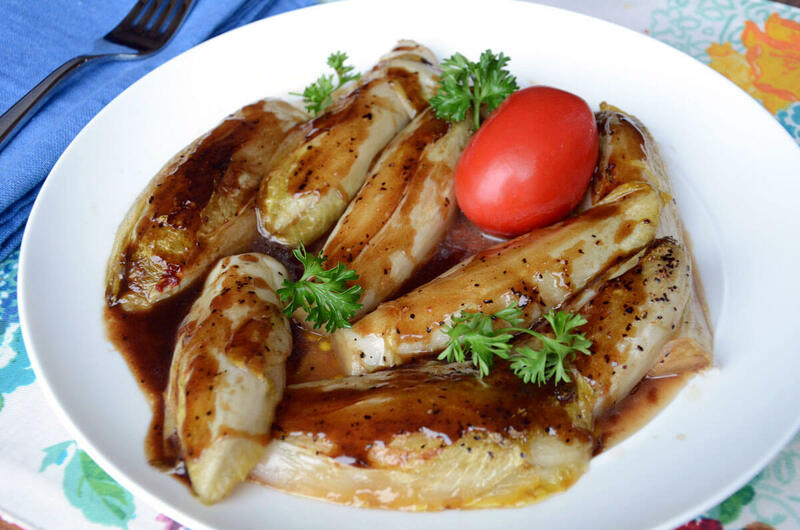 Remove endive to a plate and pour sauce on top.